WAFO has a special package of routines for random fatigue and damage analysis. The analysis is based on the statistical properties of the sequence of turning points which form the load cycles. From these min-to-max cycles one can form the Rainflow cycles and the corresponding amplitudes which are the basis for the damage and fatigue life analysis. A Rainflow filter help to remove cycles with small amplitudes which do not affect the fatigue life. 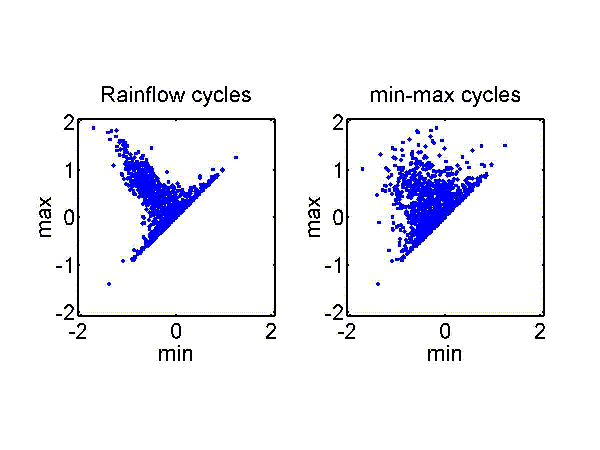 A Rain Flow Cycle (RFC) is formed by a local maximum (a rainflow maximum), called M in the figure, and one of the lowest minima of the load process to the left and right of the maximum (in the interval until the load reaches the maximum level again). 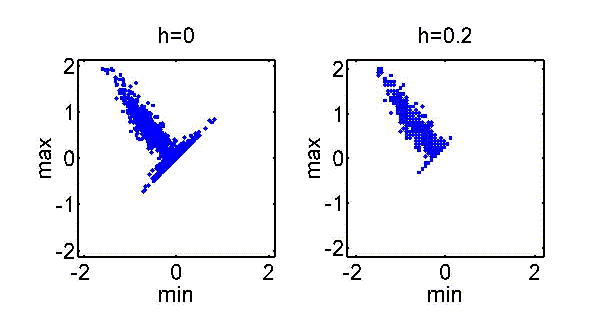 The minimum (the corresponding rainflow minimum) is the largest of the two minima, marked with m+ = mrfc in the figure. The rainflow amplitude is the difference Hrfc = M - mrfc . ... and the corresonding load cycle amplitudes. A Rainflow filter can help to remove small cycles in a load process. The red lines shows what remains of the black load curve after rainflow cycles with amplitude less than h = 0.2 m have been removed. 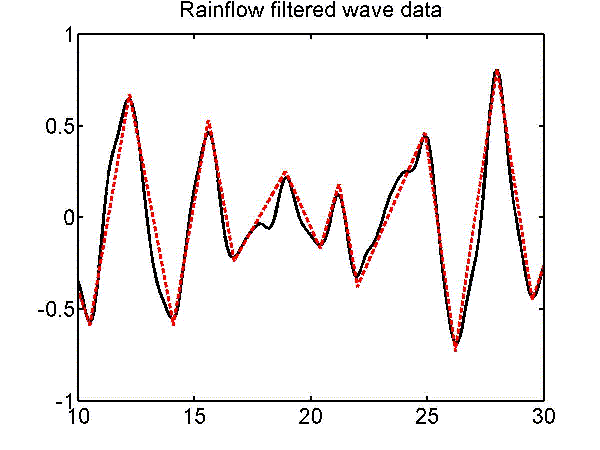 In this plot of the rainflow cycles one can see how the small amplitude cycles along the diagonal have been removed. 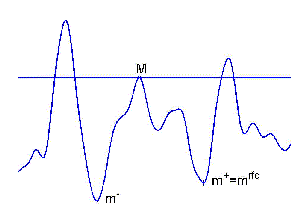 The Markov mothod for load cycles is based on the empirical fact that the transitions between turning points (from a local maximum to the next minimum and from minimum to maximum) often is well approximated by a Markov sequence with transition probabilities given by a min2max (max2min) transition matrix. Under this Markovapproximation one can calculate the Rainflow cycle properties exactly. 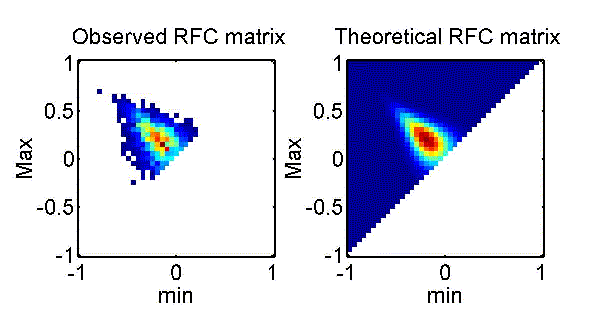 Here is an example of a Markov transition matrix and the corresponding Rainflow matrix, as calculated by WAFO. 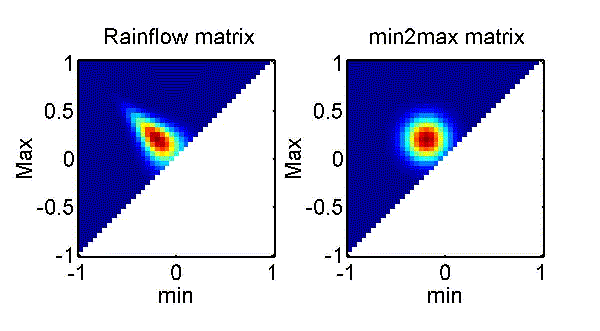 A theoretical Rainflow matrix as computed by WAFO and the empirical Rainflow distribution. By WAFO one can also compute the expected damage and the fatigue life from a load model, and compare with empirical data. 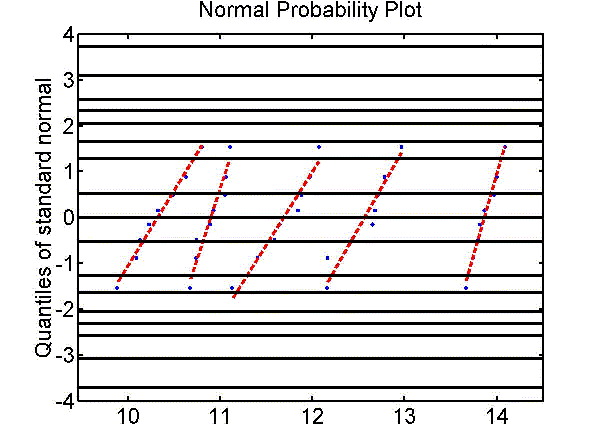 The figure shows a normal probability plot of the results of a fatigue test on five levels of average amplitude.